Within a year of the beginning of the Revolution, the land in France had been divided among the peasants, slavery was eradicated from the French colonies, price controls were introduced to protect the living standards of the poor, and a democratic constitution was created. The Committee of Public Safety passed laws introducing free education, free medical services, and the guidelines for a welfare state. The price for these reforms, however, was high: The threat of foreign invasion and counterrevolution led to a centralized dictatorship of a new ruling class and to the Terror that destroyed all opposition to the alleged betrayal of the original aims of the Revolution. As with all radical political movements, those who advocated the replacement of the status quo were soon seduced by the power they had gained and became oppressors who were worse than the tyrants they replaced. The role of the Illuminati and the Masons in the French Revolution was confused by the abandonment of the high ideals of the political movement that had instigated the original social reforms. The radicalism of the Masonic lodges before the Revolution had alienated their traditional following among the aristocratic classes in France. Even before 1789, the aristocrats had begun to resign from those lodges promoting socialism, and, as a result, their organization was seriously weakened. By 1792 very few Masonic lodges were practicing, and the movement was in a state of apathy. Those lodges that had survived faced hostility from the revolutionary government. At Versailles in 1792, the former grand master of a Masonic Templar lodge was lynched by an angry mob. Elsewhere, Masonry came under suspicion; those in power saw its role as a secret society as a cover for counterrevolution. Given that it was instrumental in the Revolution, it is ironic that within the space of a few years, French Freemasonry became the victim of the monster it had helped to create. As early as 1791, allegations concerning the role of the Masons and the Illuminati were already beginning to circulate, based largely on the confessions of Cagliostro, who had been arrested by the Inquisition in 1789. In an attempt to save his life, the comte told his accusers about the international conspiracy by the Illuminati, the neo-Templars, and the Freemasons to start revolutions all over Europe. He revealed that their ultimate objective was to complete the work of the original Knights Templar by overthrowing the papacy or infiltrating agents into the College of Cardinals so that eventually an Illuminist would be elected pope. In his confession, Cagliostro admitted that large sums of money had been placed by representatives of the Illuminati in banks in Holland, Italy, France, and England to finance future revolutions in those countries. He even claimed that the House of Rothschild, the international banking family founded in 1730, had supplied the funds to finance the French Revolution and that it was acting as secret agent for the Illuminists. No evidence to support this wild allegation has ever been uncovered, and we can only presume it was a figment of Cagliostro’s imagination or a deliberate libel for personal reasons, which are unknown. By 1796 the allegations of Masonic and Templar involvement in the French Revolution were becoming a cottage industry. It was pointed out that de Molay had been imprisoned in the Bastille, and this was the first target of the Paris mob. Connections were made between the Templars and the Jesuits on the flimsy evidence that both groups were dedicated to the setting up of a “church within the Church.” It was alleged that the duc d’Orleans, the grand master of French Freemasonry and a close friend of Mirabeau, was involved in an Illuminist plot against the French royal family. It was also said that he had practiced a secret, occult ritual and used relics belonging to de Molay in the process. Whether these were the sacred objects smuggled out of the Templar crypt in Paris on the eve of the grand master’s death is unknown. In 1796, The Tomb of Jacques de Molay was published, claiming that the French Revolution was the work of anarchists who traced their lineage back to the Templars and the Assassins. In 1797 a Jesuit priest, Father Bamuel, published his Memoires pour serir de l’histoire du Jacobinisme in which he traced the survival of the Manichean heresy through the Cathars, the Assassins, the Templars, and the Freemasons and said it was responsible for the French Revolution. He even claimed that the English Civil War had been a Templar conspiracy. The exposure of the alleged Illuminist plot for universal revolution was greeted with shock by the other European royal families. They had seen what had happened in France and believed they were next in line. Before the French uprising the police in Prussia and Austria had been placed on alert to counteract threats of subversion by secret societies. In 1790 the Bavarian government decreed membership in the Illuminati to be a capital offense. 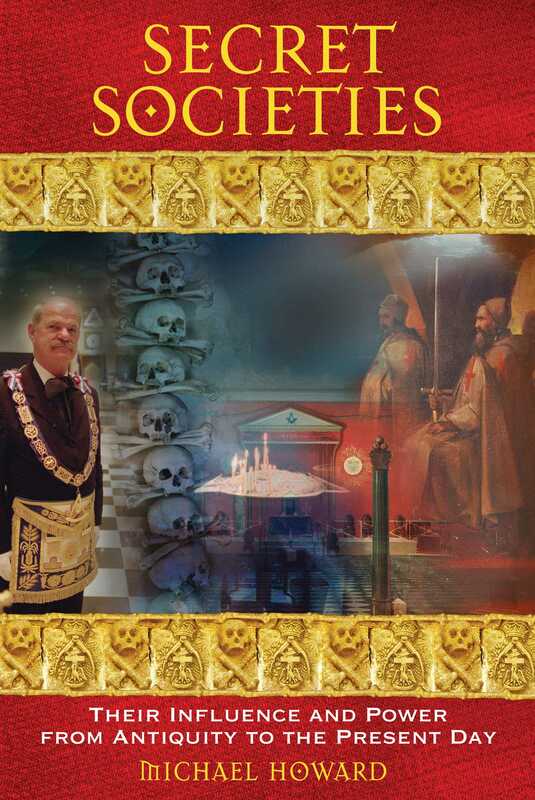 The fear of secret societies even extended to England, when Parliament debated the Unlawful Societies Act that would have prohibited Freemasonry. It failed because the English Craft had never dabbled in politics and was supported by both the aristocracy and the royal family. Michael Howard (1948-2015) began studying secret societies in 1964 and was an expert on Anglo-Saxon runes. He is the author of more than 20 books, including Traditional Folk Remedies and The Wisdom of the Runes. He lived in Devon, England. "This book took the 'theory' out of 'conspiracy theory'. . . . a well-documented account of events that date to Egyptian times."